Norman Rockwell's The Discovery (Bottom Drawer) originally created for the December 29, 1956 Saturday Evening Post cover. 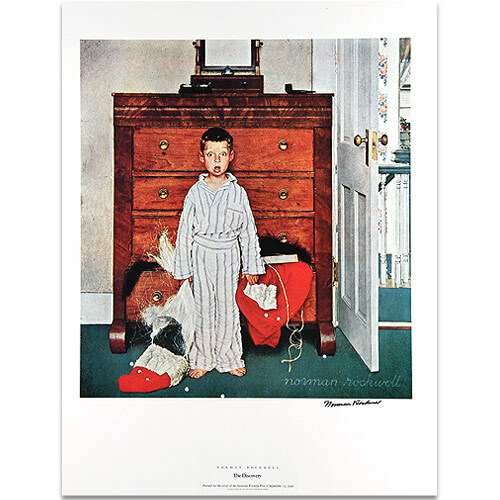 Full color offset print measuring 19" by 25" inches, hand signed in permanent ink by Norman Rockwell. The Saturday Evening Post published a Rockwell Christmas cover every year from 1919 through 1942, and its appearance on America's newsstands was an annual tradition. Rockwell's twenty-nine Christmas covers comprise a major chapter in the artist's career. But when he contributed this design in 1956, he had not proposed a Christmas cover in eight years. Rockwell had actually intended this scene of disillusionment (another theme the artist had previously interpreted) for a fall publication date, but the Post's editors held it for the December holiday. It would be his final Christmas cover.